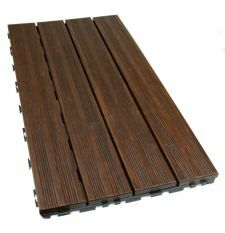 DASSO XTR Bamboo Planks bring a unique sense of style to your outdoor living space. The reversible side design allows for the product to be installed grooved side up for a distinctive look or smooth side up for a more traditional look. Planks are installed with a hidden plastic clip system secured by a quality deck screw. The clip is screwed to the deck joist, then the groove in the plank is inserted into the clip tongue and the process is repeated. The finished product is a stunning deck floor with no visible screw heads. Earth Friendly, Fungus Resistant, Low Expansion-Contraction, Termite Resistant, Water Resistant, Fire Resistant, High Density 2-3 times harder than pressure treated pine, No CCA or ACQ Chemicals, LEED Qualified, and Easy to Install clip method with no visible screw heads.